Space Conqueror-I boasts of a large 203 mm diameter mirror that devours light even from the extremes of the Universe. Specially designed for those, whose main interest is in studying deep sky objects, Space Conqueror-I clearly shows the shapes and colours of galaxies, nebulas globular and open star clusters. A set of wide field eyepieces and Barlow lenses give a wide and high magnification power range. Moon, Saturn, Jupiter, Venus, Mars and Mercury simply look superb in this instrument. Features like an equatorial mount, camera attachment and Sun screen (for Solar observation) are all included. Free books include “Treasures of the Night Sky” and “Sky Guide and Star Atlas”. Optional accessories include setting circles – for viewing sky objects using their co-ordinates, and Carry Bag. Truly an avid astronomers celestial delight. Mirror dia: 8″; Focal length: 48″; Power range: 48x, 72x, 96x, 144x, 192x, 216x, 288x, 384x; Tube dia. : 9.5″; Length: 48″; Weight: 25 kg. Also available ‘Telescope Making Kit’ for this model, see price list. Are you weight conscious? Do away with the extra kilos of Space Conqueror-I and get the same celestial delight with Space Conqueror-II. Mounted on a light weight Dobsonian mount, Space Conqueror-II can be easily carried around. Same 203 mm mirror, same power range, same capabilities, free books but easier to operate and much lighter in weight (no camera attachment, Sun screen or Setting Circles), Space Conqueror-II is an experience you will never forget. Mirror dia. : 8″; Focal length 48″; Power range 48x, 72x, 96x, 144x, 192x, 216x, 288x, 384x; Tube dia: 9.5″; Length: 48″; Weight: 20 kg. For those who crave to have a good look at deep sky wonders, here is Akash Darshan-II, a custom built telescope to fulfil their appetite. Looking at galaxies and nebulas through this telescope is a feast to your eyes. The giant 250mm mirror collects light from objects as faint as 13.8 magnitudes. You can easily make out shapes of galaxies–the bright regions, the dark regions and the clusters of stars within the galaxy are all too clearly revealed. Not to mention the fantastic views of Moon and the planets that this telescope brings out. The light weight uniquely designed Dobsonian mount of this telescope provides ultra-smooth movements on both axes. 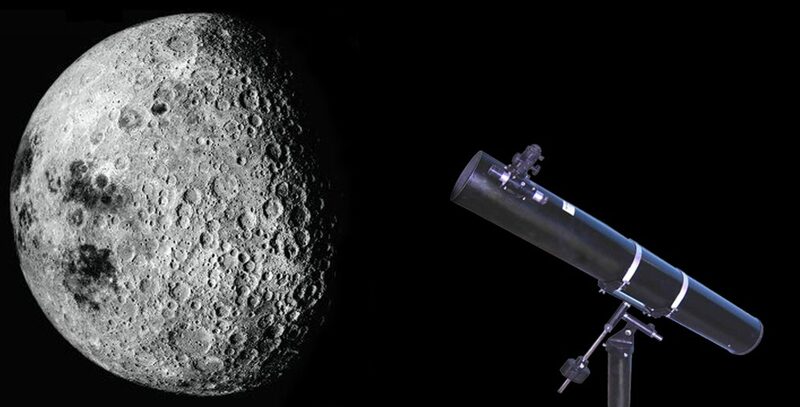 Due to the fixed position of the trunions at the centre of gravity of the tube, camera attachment or Sun screen is not provided in Dobsonian mounted telescopes. 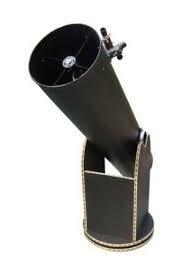 We highly recommend this telescope for those who enjoy pollution free skies from their observing sights. Mirror dia. : 10″; Focal length: 60″; Power range:60x, 90x, 120x, 180x, 240x, 270x, 360x and 480x; Tube dia. : 12″; Length: 60″; Weight: Less than 30 kg. Also available ‘Telescope Making Kit’ for this model, see pricelist. rahmand Darshan, the ultimate in our range of telescopes, is like a small observatory in your possession. It is really a large Dobsonian mounted telescope, mainly intended for observing faint deep sky objects like galaxies and nebulas. The 305mm diameter mirror of your telescope captures light from the far reaches of the Universe, allowing you to see the very faint, extremely far away objects in surprising detail. Its light gathering power is almost one and a half times more than a 10ï¿½ telescope. The large mirror also boasts of high resolution thereby showing intricate details in the lunar and planetary surfaces at high magnifications.